Why can't I sign in to the importer? If you are having trouble logging in to your Microsoft Account when using our importer, you may need to add more information to your Microsoft Account profile. If selecting Yes to grant applications permissions on the following screen brings you back to the Microsoft Account sign in screen, then you will need to complete your Microsoft Account profile before you're able to use the importer. Please visit https://account.live.com/editprof.aspx to complete your profile. 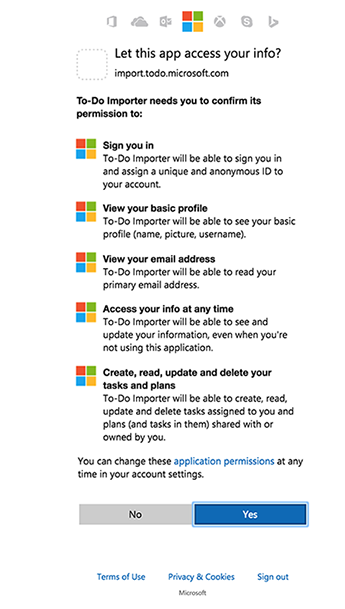 Once your Microsoft Account profile is complete, you should be able to log in to your Microsoft Account and grant permissions to our importer.